(1-2) S'rî S'uka said: 'Then there was Kes'î being sent by Kamsa [in 10.36: 20]. He as a huge horse with his hooves ripped open the earth and with the speed of mind scattered the clouds as also the celestial carriers of the gods. With his manes and neighing he frightened everyone. The Supreme Lord in response to the stir of the clouds created by his tail and his whinnying that terrified His cowherd village, thereupon stepped forward to fight. He called for Kes'î who roaring like a lion was searching Him. (3) The moment he who was hard to conquer and approach and most aggressively with a wide open mouth was swallowing the sky, saw Him before him, he rushed furiously forward to attack the lotus eyed Lord with his legs. (4) The Lord of the Beyond alert to that dodged that attack and seized him with His arms by the legs. He whirled him around indifferently and threw him at a distance of a hundred bow lengths, standing there just like the son of Târkshya [Garuda] throwing a snake. (5) Regaining his consciousness he stood up in bitter rage and ran, [with his mouth] wide open, full speed at the Lord. With a smile He then put His left arm in Kes'î's mouth, like it was a snake in a hole. (6) As Kes'î's teeth came in touch with the Lord's arm they fell out as if they had come in contact with a red-hot iron. Thereupon the arm of the Supreme Soul swelled within his body so that his belly expanded like a diseased belly does after being neglected. (7) Because Krishna's arm thus expanded his breathing was arrested. Kicking with his legs, perspiring all over, rolling with his eyes and excreting feces, he thereupon fell lifeless to the ground. (8) After the Mighty-armed One had retracted His arm from the dead body that looked like a cucumber [karkathikâ], He, unassuming as He was in His effortlessly having killed His enemy, was honored from above by the gods with a rain of flowers. Third revised edition, loaded January 3, 2014. S'rî S'uka said: 'Then there was Kes'î being sent by Kamsa [in 10.36: 20]. He as a huge horse with his hooves ripped open the earth and with the speed of mind scattered the clouds as also the celestial carriers of the gods. With his manes and neighing he frightened everyone. The Supreme Lord in response to the stir of the clouds created by his tail and his whinnying that terrified His cowherd village, thereupon stepped forward to fight. He called for Kes'î who roaring like a lion was searching Him. The moment he who was hard to conquer and approach and most agressively with a wide open mouth was swallowing the sky, saw Him before him, he rushed furiously forward to attack the lotus eyed Lord with his legs. The Lord of the Beyond alert to that dodged that attack and seized him with His arms by the legs. He whirled him around indifferently and threw him at a distance of a hundred bow lengths, standing there just like the son of Târkshya [Garuda] throwing a snake. Regaining his consciousness he stood up in bitter rage and ran, [with his mouth] wide open, full speed at the Lord. With a smile He then put His left arm in Kes'î's mouth, like it was a snake in a hole. As Kes'î's teeth came in touch with the Lord's arm they fell out as if they had come in contact with a red-hot iron. Thereupon the arm of the Supreme Soul swelled within his body so that his belly expanded like a diseased belly does after being neglected. Because Krishna's arm thus expanded his breathing was arrested. Kicking with his legs, perspiring all over, rolling with his eyes and excreting feces, he thereupon fell lifeless to the ground. After the Mighty-armed One had retracted His arm from the dead body that looked like a cucumber [karkathikâ], He, unassuming as He was in His effortlessly having killed His enemy, was honored from above by the gods with a rain of flowers. 'Krishna, oh Krishna, oh Vâsudeva, immeasurable Soul, oh Lord of Yoga, o Controller of the Universe, o shelter of each, oh You master and very best of the Yadus! You alone are the Soul of all living beings who, like fire hidden in firewood, resides within the heart as the Witness, the Lord, the Supreme Personality. You as the refuge of the spiritual soul first of all, through Your energy, produced the modes of nature. Unfailing in Your purpose You through these modes create, destroy and maintain this universe. You, this one [creator] Himself, have descended for the protection of the virtuous ones and for the destruction of the demons [Daityas], the savages [Râkshasas] and tormentors [Pramathas] who have the world of the living beings in their grip. To our great fortune You in person have sportively killed this demon who had assumed the form of a horse and because of whose neighing being terrified the vigilant gods abandoned heaven. The day after tomorrow, I will see that Cânûra, Mushthika and other wrestlers as also the elephant [Kuvalayâpîda] and Kamsa are killed by You oh Almighty One. Thereafter [the demons] S'ankha, [Kâla-]yavana, Mura and Naraka will follow, You will steal the pârijâta flower and defeat Indra. I will see You marry the daughters of the heroes [the kings] as a reward for Your valor. In Dvârakâ You will deliver King Nriga from his curse, oh Master of the Universe and capture the jewel named Syamantaka together with a wife. You will retrieve the deceased son of a brahmin [Sândîpani Muni] from Your abode [of death] and then You will kill Paundraka, burn down the city of Kâs'î [Benares] and see to the demise of Dantavakra. Thereafter You will kill the king of Cedi [S'is'upâla] at the great sacrifice [see also 3.2: 19, 7.1: 14-15]. The poets on this earth will be singing about these and other great feats that I will see You perform during Your stay in Dvârakâ. Then I will see You as the charioteer of Arjuna assume the form of Time in bringing about the destruction of the armed forces of this world. Let us approach [You who are] this Supreme Lord, full of the purest wisdom, who is completely fulfilled in His original identity, whose will in none of His exploits can be thwarted and who by the power of His potency always desists from [identifying with] the flow of things happening with the modes of the illusory, material energy. S'rî S'uka said: 'The most eminent sage among the devotees thus respectfully having honored Krishna, the leading Yadu, received permission to leave and went away most delighted about having seen Him. 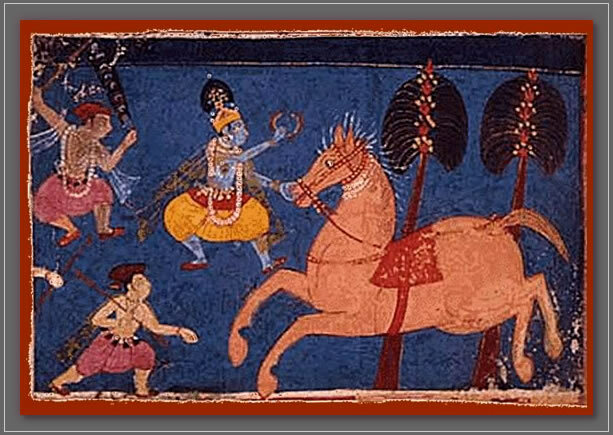 Govinda, the Supreme Lord who in a fight had killed Kes'î, still tended the animals together with the cowherd boys who were most pleased with the happiness He brought to Vraja. One day, when the gopas were grazing the animals, they at the hillside engaged in the game 'stealing and hiding', playing the roles of thieves and protectors. Some of them were the thieves, some were the shepherds, while a couple of them, oh King, played for the unsuspecting sheep. A son of the demon Maya named Vyoma ['the sky'], a powerful magician, disguised himself as a gopa and then, engaging as one of the many thieves, led away almost all the boys who acted as the sheep. The great demon threw them one by one in a mountain cave the entrance of which he blocked with a boulder so that only four or five of them remained. Krishna, He who offers shelter to all pious souls, finding out what he was doing, seized the gopa carrier as forcefully as a lion would seize a wolf. The demon resumed his original form that was as big as a mountain. By all means he tried to free himself, but held tightly in His grip he, being debilitated, failed. Controlling Him with His arms Acyuta forced him to the ground and while the gods in heaven were watching He killed him like he was a sacrificial animal. 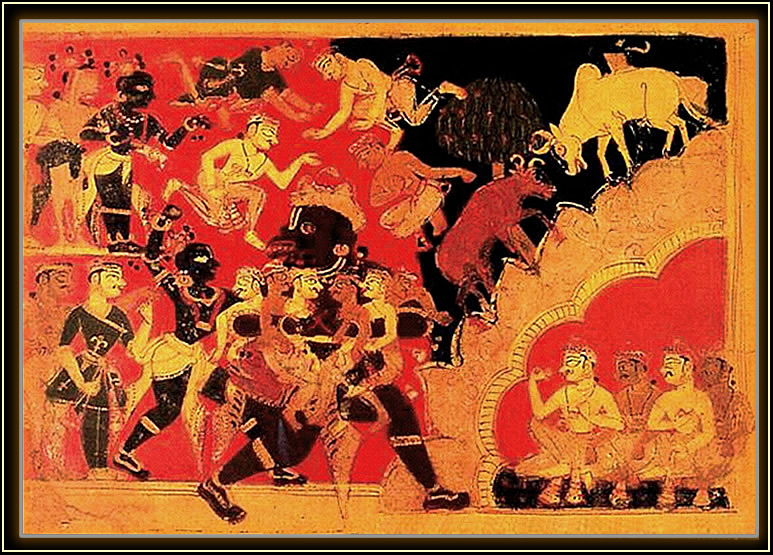 The first picture shows Krishna killing the Kes'i demon. Source. The second picture is called: 'Krishna killing the demon Vyomasura'. Bhagavata Purana. Ms., Pre-Mughal, c. 1550 .